Critics have taken aim at her new reality show The Big Give as crass and exploitive, however well-intentioned. She’s under attack from a vocal wing of Christian conservatives, armed with computers and emails, who say that her newest book pick, A New Earth, is blasphemous and spiritually dangerous. And A Course in Miracles, being taught by Marianne Williamson on the XM Radio show Oprah and Friends, is even more spiritually pernicious. On the other hand … Oprah has made a career and fortune out of making tasty lemonade out of unlikely lemons. So let’s look at it from another angle. Oprah is everywhere. You can’t escape her: reality show on ABC-TV Sunday, The Oprah Winfrey Show same network everyday, web cast that reached 139 countries as half a million people log on Monday nights to listen to Oprah and a soft-spoken, non-mediagenic German guy who looks and sounds like a college professor talking about consciousness. Then there’s Oprah and Friends on the radio. O smiling at you from the green March cover of O the Oprah Magazine as you stand in the checkout line at the grocery store. O’s reading club badge on 3.5 million paperback copies of Tolle’s book. We could also go not much farther back and talk about Oprah on the campaign trail in December, the January announcement of OWN: The Oprah Winfrey Network. The Oprah Store, a retail outlet in Chicago, opened in early February near Oprah’s Harpo Studios. There are at least two ways to look at this: Oprah is successful way beyond her dreams, as she might put it, or there’s no escape from her if you don’t want to buy her message. Some people seem to love to hate her, since Americans love it when idols fall even as we wait for the next one to survive the cut and make it to the top. Maybe at least some of us feel as strongly or ambivalently about Oprah as we might about America: big, well-intentioned, sometimes mistaken. Some have compared her stature to God, but the more apt comparison may be America, the land of big hearts and big bottoms, hard work and strong opinions, optimism and shrewdness, curiosity and consumerism, and stuff to eat, drink, read and think about. Oprah is America, and she’s a black woman who doesn’t much resemble Uncle Sam. She’s certainly a face of America in the 136 countries around the world where her TV show is broadcast. Those who criticize her language about God and spirituality invariably forget that her worldwide viewing audience uses different names for God. Just as one size doesn’t fit all, one word doesn’t fit all. Tailoring for a worldwide mass audience is tough. So is teaching. 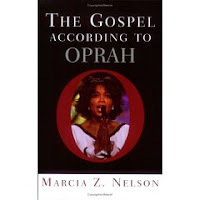 Oprah is often a didactic entertainer, giving us lessons she really wants us to get. So in an online classroom she can dispense with some of the conventions of entertainment, get away with looking at the camera and talking at an audience, and go ahead and ask really intelligent questions. Unlike many, Oprah has a lot of faith in people’s basic intelligence. She’s picked challenging books and authors like Tolstoy, Faulkner and now Tolle. You can’t say she’s not ambitious. You also can’t say she does not learn from mistakes. She abandoned the Jerry Springer style, trash-TV talk show format in the middle 1990s and chose a more edifying, and profitable, path. She made author James Frey sit under her wrath on network TV and apologized for her earlier defense of the A Million Little Pieces author accused of fabrication. She has even made fun of some of her own mistakes. After all, recanting makes for more shows. So, Oprah may stumble here and there. But a woman who believes in The Power of Now, author Tolle’s earlier book, knows that “now” constantly changes. A lot of us are staying tuned, though not necessarily to reality TV or esoteric spirituality books. In the meantime, pass the lemonade.